Still a little way to go but here is a quick update. I'm waiting for the paint to dry before working on it further. 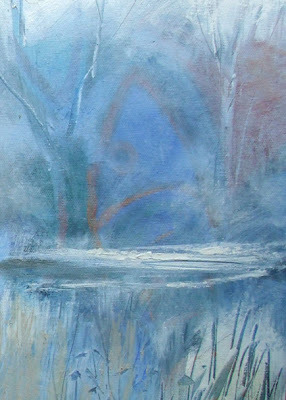 You can see a bit of pentimenti* - the copper shape shining through in the trees at the back - some will remain but the unnatural shapes, like the circle and almost triangle, will be lost/adjusted in subsequent layers and glazes. *Isn't that a nice word for an altered underpainting showing through? I've struggled to find painting time recently - but this is the start of a new canvas, one of a series along with this one in the previous post here, this one, and others if you search under the tag 'trees' . It is done over a still life painting that I didn't like with a lot of blues in it and some copper - the paint is very thinly scumbled in places, allowing the colours to come through and become part of this work. Sometimes I really like working over an old canvas because of the things that happen, the colours that come through - sometimes shining through thin layers of paint and sometimes fragments, flickering through overlaid colour. What to do with failed paintings? cut them up .......... and re-use pieces, playing with ideas for future work. 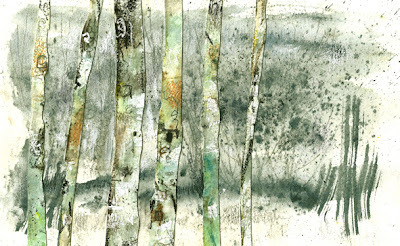 These pieces for the trees were cut from wider trees in a painting I decided was a write off - a what-on-earth-was-I-doing? piece compositionally. 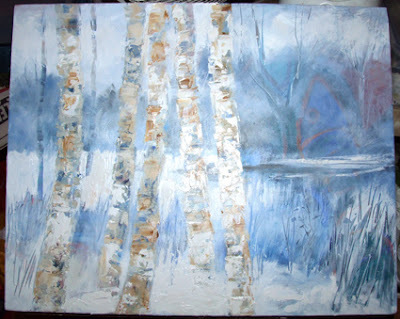 The birches were subtle colours and I thought it would be interesting to keep the background in greyscale to bring out the colours but keep the whole piece very low key. 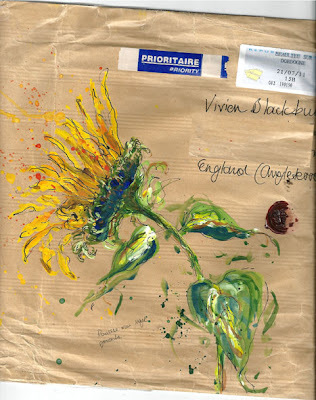 They were done in a mix of media - Winsor & Newton artists watercolours, a touch of Inktense, some gouache, some coloured pencil. Do you always stick to a standard size for work to enable easy framing? or do you allow the subject to dictate the format? For me there is no question. The subject dictates the format. I tend to find the standard sizes are frequently not right for me. I enjoy working on long thin formats, vertical or horizontal, square, just off square - all sorts. OK it involves custom framing if they are on paper, or making my own canvasses up if on canvas. Use the same framer regularly and the they will usually do you a competitive price - mine does, so the extra cost is minimal. I don't frame canvasses, I use deep sided gallery wrap, paint the sides neatly and that's that. and the cards received so far. You can see all the cards in the exchange so far, here at Postcards from my Walk. My daughter rang me this morning - no pressure - she said. But could I do a party invitation for her to email for Sam's 4th birthday party, to send to friends mums - by tonight please? So here it is - no time for thinking around or reworking. The drawing is in coloured pencil and the writing was done in Photoshop, a line at a time so I could position it closely. There is a bit more below this with the venue, date, time and RSVP stuff. So tomorrow I'm hoping to PAINT. 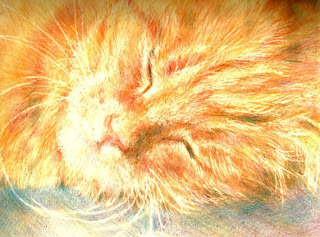 Another drawing of my daughters cat, sleeping this time with her beautiful bushy whiskers curling, fur glowing in the sunlight. 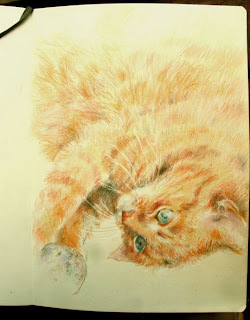 Again in the A4 moleskine folio sketchbook, done with a mix of Lyra and Polychromos pencils. This one is much closer up, so the fluffy, overlapping texture of the fur shows much more with lots of drawing back in with the Jakar eraser for the pale over dark sections and the whiskers. I deliberately gave the background a mauve/blue haze of colour to cool down all those warm glowing colours and offset them. You can see the layers of colour in this detail and the lines drawn back in with the Jakar eraser, clean back to the cream moleskine paper. So how did I work? 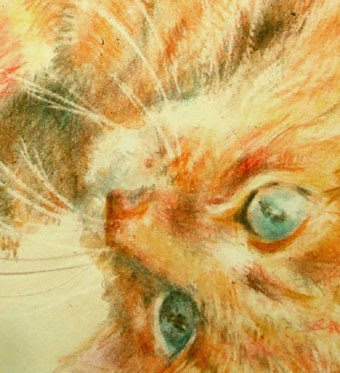 My little Jakar battery eraser was essential for drawing back through the colour for those whiskers, adding highlights to the eyes and creating light fur over shaded areas or darker stripes. It's such a brilliant drawing tool. Coloured pencil on moleskine paper erases really cleanly and I think is my favourite surface for using them alone, rather than in a mixed media piece. I also like warm cream paper. I rarely erase as in correcting and didn't at all here - the first marks are faint, were in orange and were assimilated into the final result. That gives plenty of time to move things a little before going in with more colour and more detail, knowing you are happy with where it's positioned. This one is a present for my daughter. In memory of her much loved cat who sadly is no more. She was beautiful with eyes that appeared really blue against her fur, very unusual. 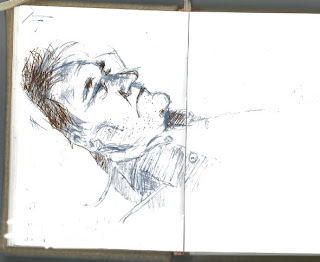 Lots of hospital in my life at the moment so drawing and painting has slowed down a bit.